Marinate fish with the ingredients and keep aside for 30 mins. Fry the fish on a tava and keep aside. Heat oil in a kadhai and temper mustard seeds. Add curry leaves, fenugreek seeds and onion paste. Saute a while and add ginger-garlic paste. Add chopped tomatoes and mash it. Add turmeric powder, red chili powder, coriander powder and cashew paste. Mix all and cook for 2 mins. Add curd, lemon juice and salt to taste. Cook it covered till the oil separates. 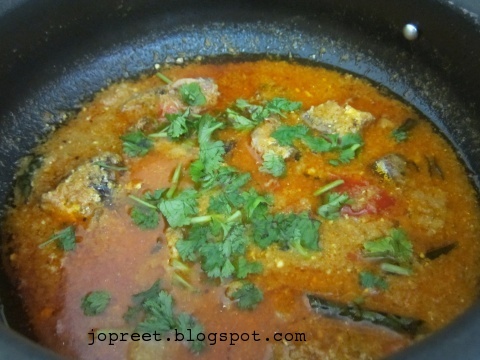 Add fried fish to the curry and cook it covered for another 10 mins. Garnish with chopped coriander and serve hot with steamed rice. 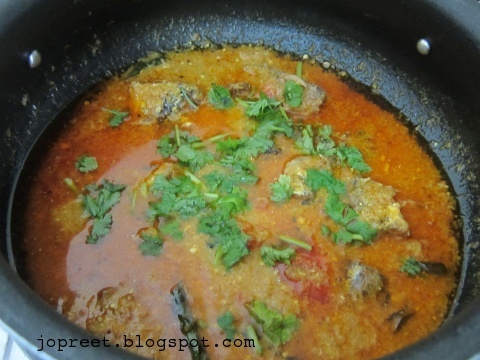 DELICIOUS AND MOUTH-WATERING FISH CURRY..
Wow …….mouthwatering fish curry. Looks delicious.